Oh what can I say about a genius author whose latest book does not live up to the expectations of the last? I loved reading Cloud Atlas – loved it – both times – text and audio versions – the whole thing. 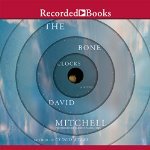 I also loved The Thousand Autumns of Jacob de Zoet (with a small exception) , but I wasn’t so crazy about Mitchell’s earlier Black Swan Green. Overall this is a very interesting baggy door-stopper – it’s overly convoluted and, allowing for one really stupid part, it’s compelling and fun mostly – great story-telling. Part 1: In 1984 the 16-year old Holly Sykes, who sometimes hears “radio voices,” runs away from home to be with her much older boyfriend. This doesn’t quite work out, but during her time away she meets (or there are flashbacks of) some rather strange people who will reappear throughout the novel. Holly is the main character in this novel which stretches from 1984 (an ominous year, eh?) to 2043 when she’s 75 years old, but there are several other featured 1st person narrators. Except for a cliff-hanger ending, Part 1 is an introductory novella of its own. Part 2: In 1991 Hugo Lamb is a “posh boy” playing at being a student at Cambridge and skiing in Switzerland where he gets in trouble with his buddies and so he, like Holly, runs away. Hugo and Holly meet on the slopes, fall in love and then, also like Holly, Hugo has mysterious visitations. Moving along to Part 3, 2004, where Holly is now partnered with Ed Brubeck, a war correspondent, and they have a young daughter named Aoife (ee’ -fay) who leaves her home and disappears (lots of disappearing kids in this novel), the parents panic and Holly saves the day by means of some kind of “occult?” communication. There are two other major characters, Crispin Hershey, an aging raging has-been author in 2015, and Marinus, a so-called immortal Horologist who was Holly’s psychologist when she was a child and now, in 2025, explains the workings of the “war of the semi-immortals.” I really enjoyed Crispin, not Marinus so much – gender changing was hard. James Wood in the New Yorker. Thinking about it I wonder if Mitchell didn’t tell his children strange stories about what happens to children who run away or wander off and developed it for a larger, possibly more mature, audience.